Development board for 18 pin PIC microcontrollers with power supply circuit, crystal oscillator circuit, RS232 port, ICSP/ICD port, 4 relays output, 4 optocoupler isolated inputs. 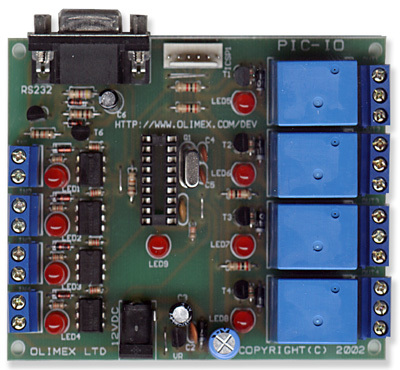 PIO-IO Firmware - Our developed firmware programmed in a microcontroller that allows galvanic and optoisolated I/O interface from a RS232 port. Click here for PIC-IO Firmware datasheet.